A lot of people absolutely adored Nemr Abou Nassar’s recent 20 minute rant against LBC and the situation in Lebanon that LBC somehow represents through their misrepresentation of an award show. After all, aren’t the best kinds of pep talks those carried about by people financially better than 95% of the Lebanese population and with a second nationality to fall back on, just in case? LBC has now replied to Mr. Nassar with what I think is an absolutely brilliant example of professionalism. For the first time, you have a Lebanese TV station acknowledging a mistake happening and taking the blame for it. Now LBC, my hat is off to you. Many of you rightfully expect LBCI’s transparent and honest answer to Mr. Abou Nassar’s video. Like most would agree, LBCI succeeded in exporting Lebanon to the world with unparalleled levels of professionalism. This did not happen by coincidence or magic, but as the result of the perseverant work of hundreds of professionals. And it happened because we believe in our country, in its talents, and in all men and women dedicating themselves for Lebanon, whom we reassure of our unwavering support. We do not (thank God!) pretend to be perfect. Mistakes happen with all corporations, and we believe the successful institutions are those who draw lessons to avoid repeating them. Let us be clearer: LBCI takes full responsibility of the mishaps that took place and regrets their impact on all the people involved. We salute the efforts of Dr. Sfeir and For Lebanon and sincerely hope that our apologies will be accepted. The performance, which is not reflective of our standards, was due to the fact that the filming was outsourced in all good faith by LBCI to an external team, which did not perform up to expectations. Again, we are not trying to put the blame on someone else as we fully acknowledge our lack of proper selection. And we are willing to do everything possible to repair the harm that was inadvertently made. What is an unforeseen sub-performance should not be dealt with as a premeditated wrongdoing, or as a hidden agenda targeting local talents. Though we fully understand the frustration, linking this incident to malevolent intentions is taking things out of proportion. We cannot stress enough how much LBCI supports Lebanese talents from all genres and languages and our track record in this case cannot be brushed aside because of a blunder. An unjust accusation cannot be an answer to a non-premeditated mistake. Many people can testify that LBCI has broken many partnerships with organizers who did not abide by our standards in term of respecting the people attending the event, thus speaking of intentional sabotage is simply not an option. Criticizing what is wrong is what we do, and we support numerous points that Mr. Abou Nassar has raised, but we are against dramatized criticism which turns into a witch hunt. If only other institutions in this country can be this professional in the way they handle criticism. This is a Lebanese meme done by twitter user @RachaMneimne and, even though I said I wouldn’t blog about the whole thing again, I think this is way too spot-on to be passed on. As a sum-up, here’s what Lebanon has been busy with for the past few days. Nemr Abou Nassar noticed the video and made a big deal of it. Twitter drama with Klink ensued. Everyone started making fun of her as well. (Check it here). Nemr Abou Nassar went on his radio show and had a full-blown rant about the state of the music industry. I’ve seen many people call it EPIC. I see it as everything but. (Check it here). Finally, thank you Racha for telling it like it is. Remember when I said Nemr will be using Myriam as one of his sources? Well, it didn’t take long. Here’s a full-blown 30 minute radio show about Klink and about what he thinks she represents of Lebanese society. I don’t listen to Lebanese radio so this is my first time hearing this. I agree with him on many points that are raised. Our music scene is despicable. However, how’s calling women whom you don’t approve of whores and sluts part of the Lebanese culture you’re trying to bring forward? 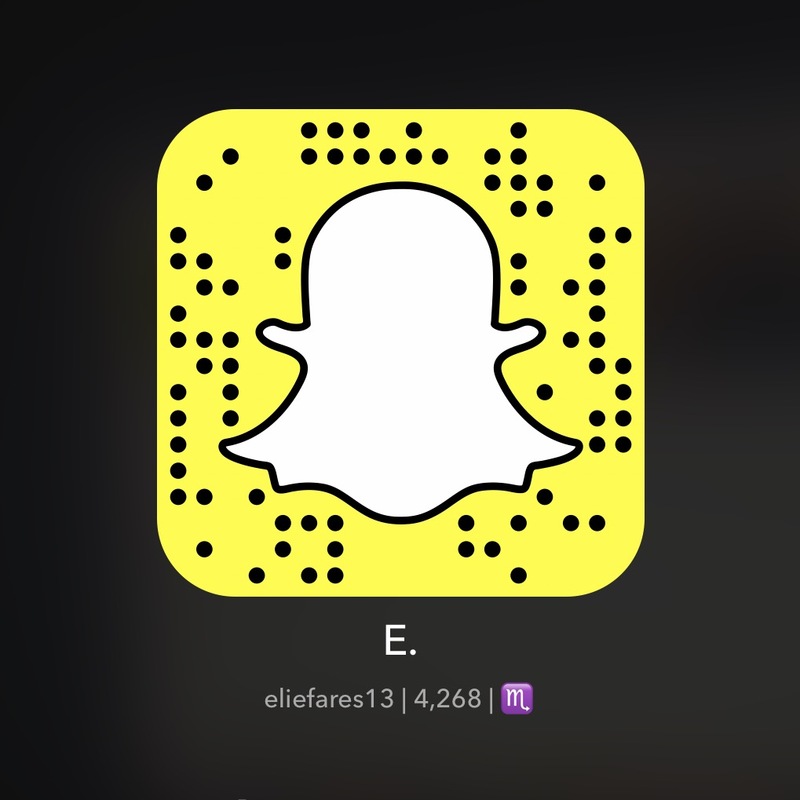 Is Myriam Klink giving Lebanese women a bad image? Only people who categorize a whole population based on a distorted perception would think so. And we are fueling that, giving way more attention than necessary to those we “deem” inappropriate. Simply put, Nemr Abou Nassar has given Myriam Klink 30 minute of radio time during prime time, which she wouldn’t have dreamed of. He even says the MixFM site crashed. He has made her almost as famous as he is in almost one day. Does he think the points he raised will resonate with her or those who like her? I doubt. 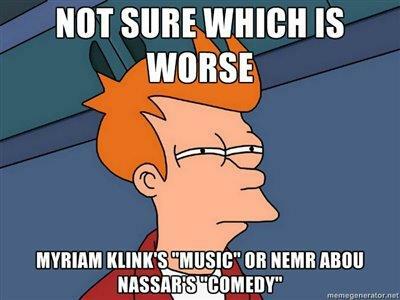 I’m pretty sure if Nemr had discovered Nancy Afiouny before or Lara Kay, this whole debaccle would have been a repeat. In fact, I’m sure both Nancy Afiouny and Lara Kay would kill for the publicity Klink has gotten in 48 hours. Anyway, both sides of the dispute have said their share. Can we refocus on important things now? Li2anno sara7a, shi bila33e. And this is the last Myriam Klink/Nemr Abou Nassar post I’ll have here. Enough with giving attention to the both of them.